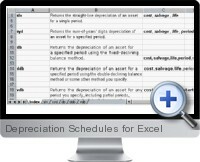 Depreciation Schedules for Excel (Amortization Excel Templates) provides simple and accurate Excel templates to input asset data and desired depreciation periods and methods. The accounting depreciation values for each period in over a schedule are automatically calculated so that results can be used in further analysis or financial accounting statements. Calculate the straight line depreciation of an asset for a single period. Calculate the sum of years digits depreciation of an asset for a specified period. Schedule depreciation of an asset for a specified period using the fixed declining balance method. Schedule depreciation of an asset for a using the double declining balance method. Flexibility to specify partial periods, or any other depreciation method.